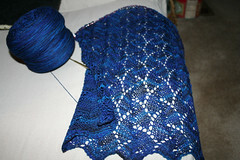 Thanks for all the lovely comments on my shawl-in-progress. I am so delighted with how the Wollmeise colorway I’m using works so well with the pattern. I have a hank of the Dani colorway, how in the world did you wind it? Did you wind half of it, then cut the yarn, then wind the other half? I’m concerned that my ballwinder won’t be able to handle a cake that large. The winding of the yarn was not pretty. I have an electric ballwinder that I acquired several years ago. I don’t think it’s available in the U.S. anymore. And sadly, it’s showing its age — but with a little encouragement it will wind a skein of yarn off a swift. 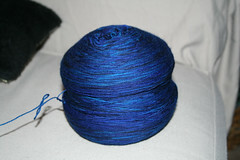 My 300 gram skein of Wollmeise is over 1700 yards and I wasn’t too enthusiastic about winding it by hand. So, without really thinking it through, I popped the skein on my swift and started winding with the electric ballwinder. It is important to note here that my ballwinder is capable of holding an 8 ounce skein. And that the skein of yarn I was winding was over 10.5 ounces. So of course I ended up with a big fat ball o’ yarn on the ballwinder that was threatening to overflow, and about a quarter of the skein left on the swift. If the ball o’ yarn were to overflow, it would get caught in the gears of the ballwinder and that is a definite no-no. So I took the ball of yarn off the ball winder and manually wound the last quarter skein, pulling it through the guide on the ball winder because there was no way I was going to cut it. Incidentally, the pattern calls for approximately half the amount of yarn that’s in my giant ball o’ Wollmeise, so I really could have cut it. But I’m stubborn like that. And I’ll likely give away the remainder of the skein of Wollmeise when I’m done, so I wanted an unsullied skein. The Little Princess, with her box. Boy, is she ever gonna be pissed when I throw it away . . . Simply beautiful shawl and colorway! A cat and (in) a box! Perfect companions! luv.m. still lusting after that colorway of dark blues. Could you tweak the color so it doesn’t look so attractive? That’s a whole lotta yardage! I bet even a quarter of a skein would have taken a while to wind by hand. The shawl looks like a real beauty too. 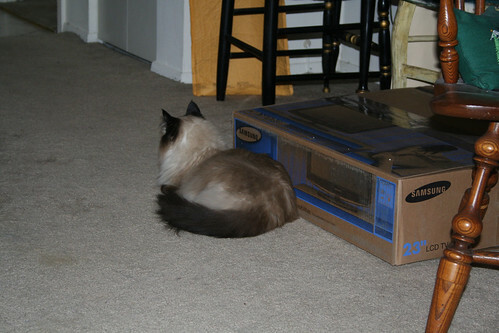 Motorboat (my cat) and I think you should keep the box for Lucy to play with/in. Boxes are so cool for cats. I love love love the shawl. Do you get to keep it or do you have to give it to the designer? Last year, I had a 2400 yard skein of laceweight to wind. I did it with a swift and hand cranked ball winder. I wound the yarn into 4 cakes without cutting the yarn. The end of one cake is the beginning of the next. This is spooky. I was just coming over to your blog to copy the URL as a link for mine because I mentioned the Eyelet Rib socks. When – low and behold- there’s a picture of Lucy’s backside and her box. The spooky part is- I just posted a picture of Chief’s backside protecting his box. Must be a Ragdoll thing. Why can’t Lucy just keep the box? I have bought stuff from her. Good customer service. They have a site that is independent from Ebay too. wendy, do you lightly steam block as you go along? for the pictures? your lace doesn’t look wonky like my vision of most lace while in progress. or is the heavier yarn helping? This is going to be a such a beautiful shawl. I can just see it strikingly blue over a silvery grey dress. The shawl and the yarn go perfectly together. Just beautiful. By the way, since I don’t see your blog until the day after thanks to living in an earlier time zone—Happy St. Lucia Day! I just love that shawl pattern, and the yarn is beautiful. Don’t you find that Lucy eventually becomes bored with a particular box? My cats couldn’t keep away from cartons–for a time. And then one day, inexplicably, they would move off to something else (a warm towel straight from the dryer was a favorite, as was a paper bag from the supermarket), and never go into that box again. The pattern is stunning, especially in those vibrant blues. The blue is so vibrant and pretty, and the yarn shows the pattern off so beautifully. The yarn winding? I would do the exact same thing — dive in, realize that it was going to be a problem, and stubbornly soldier on to make it work. To make a ball winder hold just a bit more, create a cardboard base (like a 45 record) to slide over the center before winding. It will allow your yarncake to get wider… you have to do some experimenting. I used cardstock (like cereal box weight) rather than corrugated so it wouldn’t bend at the corrugations. Unfortunately, they don’t hold up all that well, so when you make one that works, copy it to make several. Keep in mind that the edges are going to want to run into the yarn guide and the winder itself, so it can’t be too big – but usually you just need an inch or so to finish things off. i’ve really got to get knitting! i just got some new (self patterning!) yarn. i’m going to make some socks for my sister to give to her for christmas. but i just got the yarn today! i know that she’ll wait for them if we need to. but i’ll get as far as i can. Isn’t it amazing that we’ll spend all of this money on our little darlings, when they really just prefer the box that it came in?? 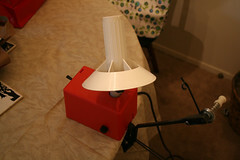 I just rebuilt my electric ball winder and it ZOOMS. It was easy. The belt inside was slipping, then broke. I thought it was the gears from the grinding I heard, but not, just the belt. I got some poly belt from Babe’s Fiber Garden of the PVC spinning wheel fame. He has the perfect drive belt for this. I cut a piece, based on the one that was there, heated the ends and held them together. Voila. I trimmed the join with a box cutter, put it on and boy do I have power now. I did make it a hair smaller than the black one since it had stretched. Just go slowly when removing the cover so you don’t dislodge the connectors inside. I never did get mine all the way off, but didn’t need to. I did have to take out the clip on top with a screwdriver end and then reinstall. Make sure you fully seat the main plastic, eh, pillar. If not, the teeth of the, eh, twirly part won’t mesh. It took a week to get the belt and less than 5 minutes to fix it. Man, I have been winding like mad since. Alpaca cloud in less than 1.5 minutes with no touching. 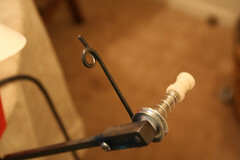 Oh, and while I was monkeying around, I did open the metal loop guide closest to the, eh, bobbin. That way I can easy thread it instead of trying to get a thread in the hole – I just loop it. Could this have been any more confusing?